We had to make a very last minute booking and the hosts were wonderfully accommodating and welcoming. The apartment was bigger and far cosier than the photos suggest; it's beautifully finished. The beds were about the most comfortable we've found in our recent travels, and the bedrooms were lovely, and special. Unusually for Spanish places, the light was very good and big windows certainly help. Short walk into town (good cafes and playgrounds! ), countryside for dog walking only a minute away. Todo perfecto, el apartamento nos gustó mucho, muy cómodo y todo muy bien colocado, muy bien en general. El apartamento estaba muy limpio, camas cómodas, tenia lo necesario, tranquilo, está lejos playa pero bien para hacer turismo por los pueblos de alrededor y Santander. Una casa muy acogedora, con muchisimos detalles y comodidades, todo lo que necesitaba lo tenía.Temperatura muy buena, calefacción eléctrica, vitro, micro, horno, utensilios cocina, sabanas, mantas, toallas, wifi, 2 tv, ....en fin de todo. Muy limpio.Muy buen gusto en l decoración. Buena situación cerca del centro de Suances, con parking gratuito y pequeño jardín privado. Lock in a great price for Apartamentos Copi Villa de Suances – rated 8.4 by recent guests! One of our best sellers in Suances! 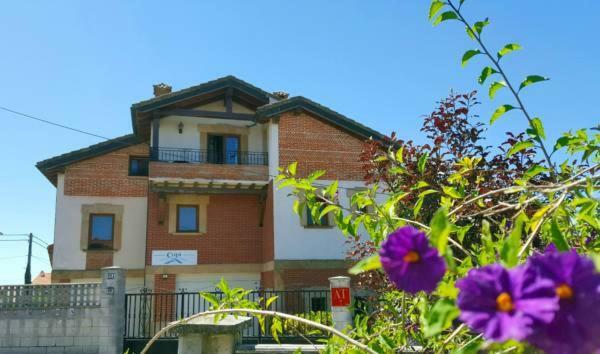 Offering a terrace and views of the mountains, Apartamentos Copi Villa de Suances is located in a quite residential neighborhood in Suances in the Cantabria Region, 12 mi from Santander. Santillana del Mar is 4.3 mi away. All units include a seating and dining area, as well as a barbecue. There is also a kitchen, fitted with a microwave and toaster. A refrigerator and stovetop are also provided, as well as a coffee machine and a kettle. Towels and bed linen are featured. Bike hire is available at the property and the area is popular for hiking. Isla is 24 mi from Apartamentos Copi Villa de Suances, while Somo is 16 mi from the property. The nearest airport is Santander Airport, 11 mi from the property. When would you like to stay at Apartamentos Copi Villa de Suances? This apartment has a private entrance, microwave and electric kettle. Please note that this apartment is accessed by stairs and is on the first floor. This apartment has a microwave, patio and dining area. This apartment features a seating area with a sofa, kitchenette and tea/coffee maker. It features two bedrooms. A double bedroom and a truckle bed bedroom, both beds can be set together fitting guests' needs. Please note that this apartment is accessed by many stairs. House Rules Apartamentos Copi Villa de Suances takes special requests – add in the next step! Please note that check-in before 14:00 is possible, subject to confirmation and availability upon arrival. Please inform Apartamentos Copi Villa de Suances of your expected arrival time in advance. You can use the Special Requests box when booking, or contact the property directly using the contact details in your confirmation.